Our large variety of water features include including bubblers and waterfalls that drop into your pool. 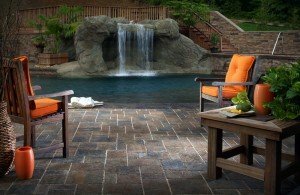 Adding a water feature your Richmond, VA home’s landscape will create a calm and relaxing atmosphere for entertaining family and friends. The Hardscape Center in Richmond, VA can supply you with the materials needed to build a water feature. We also offer full service design and installation of water features, bubblers and more so you can relax while we do the work. If you are doing it yourself, make sure to ask our experts for tips on ensuring that your water feature project is solid and long lasting. When you’re ready to improve your property, call The Hardscape Center at (804) 353-4444. Contact us today to get started.